We add text titles to our projects to tell the audience something they can't figure out on their own, such as the title of our program, the name of the person speaking, or technical details about a subject. Final Cut Pro X has almost 200 different text effects that we can add, but the process of adding titles is essentially the same. Adding titles is what this article is about. Text or titles. Words placed on the screen. I use these terms interchangeably. Superimpose. Text displayed on the the screen with other video below it. These are also called "supers" or "keys." Full-screen. Text which occupies the entire screen. Lower-third. Text which fits below a person talking; in the "lower-third" of the screen. Info-graphics. 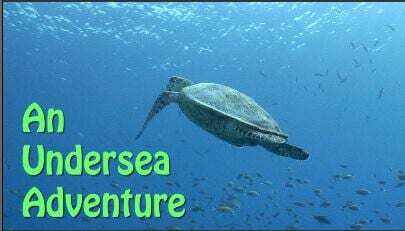 Full-screen text which is superimposed on a graphic, generally use to convey technical information. Typical uses are sports statistics or other information which is easier to convey using text than having someone read the words. At its simplest, we use titles to display his (its?) name. 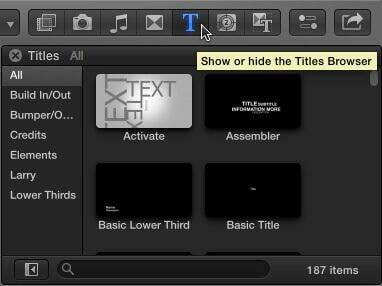 In the Timeline, put the playhead where you want a title to appear and type Shift+Control+T. This inserts the default lower-third title at the position of the playhead. 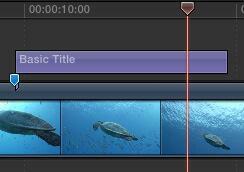 The title, like almost all titles, has a default duration of 10:00 seconds. NOTE: The big limitation of this lower-third title is that it can only be positioned in the left corner. Moving it to the center or right corner requires manual adjustment. You position or trim a title the same as any video clip: drag the clip to a different location, or drag an edge to change its duration. Select that title and delete it by pressing the Delete key. This time, type Control+T and the default full-screen title appears in the center of the screen. Again, this has a default duration of 10 seconds. If you look right in the center of the screen, you'll see the word "Title." Yes, its darn near invisible. And, yes, it looks, um, ugly. However, we have a TON of formatting control to make this look however we want. Select and delete that full-screen title. 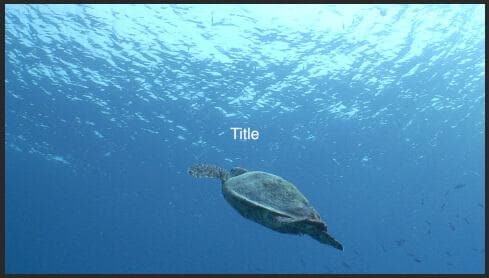 There's one more way to apply a title: dragging from the Titles Browser. 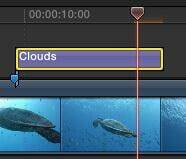 Let's add a totally ridiculous title to our turtle - drag Clouds from the Title Browser and place it above the clip at the point where you want a title to appear. 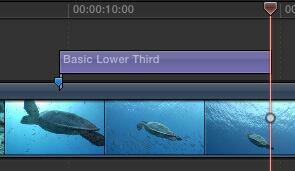 NOTE: I'm using a marker in the Timeline to help me find the same place in a clip so my screen shots are consistent. Markers are not needed in any way for titles. Um, yeah. So, some titles look more professional than others... You can delete this title now. Add a new full-screen title (type Control+T) to the Timeline. To change the text in a title, double-click it in the Viewer. 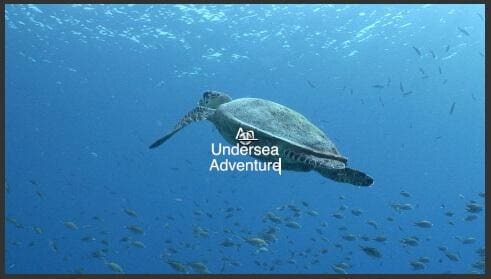 Here, I've changed my title to "An Undersea Adventure." NOTE: We can also change the text using the Inspector. I'll show you how in a few paragraphs. Pick whichever method is easiest for you. All text, in any title, can be changed by double-clicking it in the Viewer to select it, then typing the new text you want to use. You can format any text that you can select. This means that you can format entire phrases, words, or individual letters differently. For this article, I will format everything the same, because once you know how this works, you can experiment on your own. Here, I selected my entire title and opened the Inspector (shortcut Cmd+4). Click the Text tab at the top. This section of the Inspector allows you to format the text. NOTE: The text box near the top of the panel is the second place you can select text for formatting. If you want a fast way to format text, click the word "Normal" at the top. This displays a menu filled with different text formats. Some of these formats look pretty dreadful; the rest look worse. NOTE: You can create your own text styles. Refer to the Help for information on how. The Basic section of the Inspector allows you to change fonts, size, alignment... all the standard font settings we see in other programs. 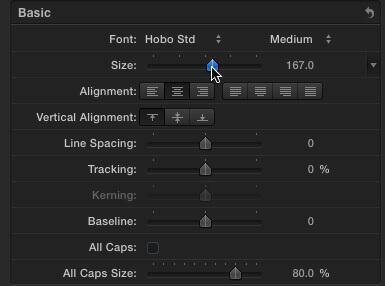 Here, I've changed the font to Hobo Std, at 167 points. Line spacing. Adjusts the vertical distance between lines within the same paragraph. Tracking. Adjusts the horizontal spacing between letters. Baseline. Adjusts the vertical spacing of text compared to the horizontal line running thru the center of the white circle in the Viewer. 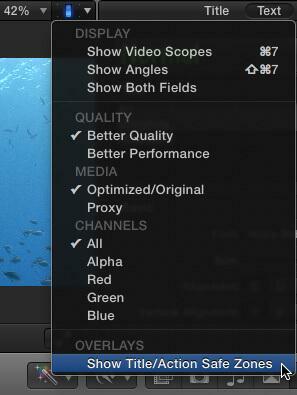 The Face section allows us to change font color, opacity and blue. Outline and Glow allows us to add, not surprisingly, outlines and glows. You can adjust these as you see fit - I tend not to add outlines or glows. However, I STRONGLY recommend adding drop shadows to all text that you want viewers to read. 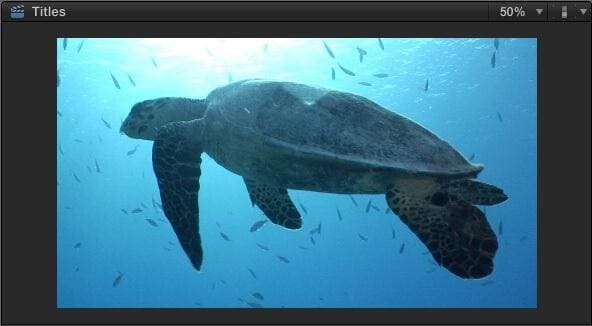 Video, even HD video, is low resolution compared to print. Drop shadows make your text much easier to read. 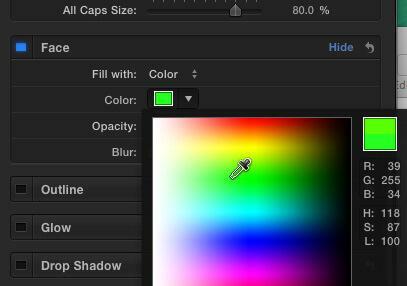 These are the settings I recommend for drop shadows. After making a few changes in the Inspector, here's the final result. Very cool - and very different from where we started! Since television was first invented, we needed to compensate for the differences in TV sets by designing graphics to stay within Action Safe and Title Safe boundaries. While much of today's video is designed for the web, your titles will look the best if you follow the same guidelines. Go to the Switch in the Viewer and select "Show Action Safe/Title Safe Zones." This displays two pale rectangles in the frame. The outer rectangle is called "Action Safe," the inner one is called "Title Safe." 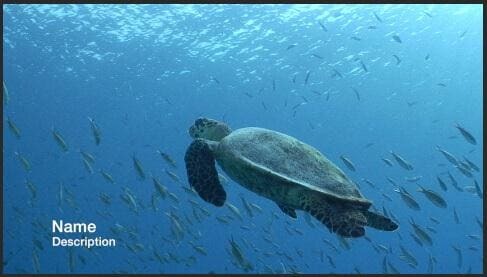 Action Safe is 5% in from all edges; Title Safe is 10% in from all edges. 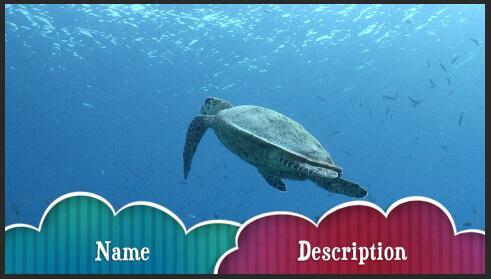 When designing text and graphics for the web, keep all essential elements inside the outer rectangle. When designing graphics and text for broadcast or cable, keep all essential elements inside the inner rectangle. Here, for example, notice that my title is fully contained within Action Safe. Titles give our programs character and personality, plus they explain what's going on to the audience. 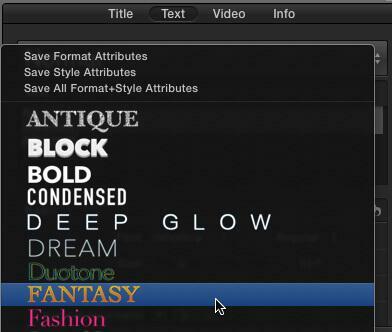 Final Cut Pro X provides a wealth of formatting options to make our text look great.